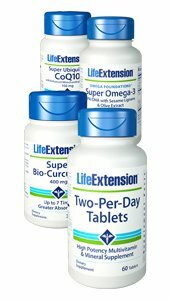 The Core Health Essentials Kit: Since it is nearly impossible to eat enough food to get all the nutrients the body needs on a daily basis, Life Extension has combined several supplements to provide strong essential foundations. The Core Health Essentials Kit – provides a 60 day! supply of our top selling daily supplements for long lasting health. Two-Per-Day Tablets have the highest nutritional potencies of any science-based multivitamin formula that can fit inside two capsules or tablets. With relatively high amounts of folic acid, vitamin D3, zinc, lycopene, lutein, chromium, selenium, and B-complex vitamins, Two-Per-Day Tablets can stand up to any multivitamin supplement on the market. Super Bio-Curcumin® features BCM-95® … a patented curcumin that reaches up to a 7-times-higher concentration in your bloodstream than standard curcumin supplements. Curcumin benefits nearly every organ system in your body. It can inhibit inflammatory factors, support immune and heart health, and even provide antioxidant support. Super Ubiquinol CoQ10 with Enhanced Mitochondrial Support™ works to re-energise every cell in your body. It provides the highly bio-available ubiquinol form of CoQ10 plus a compound called shilajit. Researchers have found that shilajit boosts CoQ10’s beneficial effects by stabilising the ubiquinol form of CoQ10 to prolong its action at the cellular level … and by facilitating more efficient delivery of CoQ10 into the mitochondria for greater cellular energy output. Super Omega 3 EPA/DHA with Sesame Lignans & Olive Fruit Extract emulates the heart-healthy Mediterranean diet by providing you with fish oil that exceeds the standards for purity set by an international rating agency. It also supplies: Standardised olive extract (fruit and leaf), that delivers the antioxidant polyphenols hydroxytyrosol, tyrosol, verbascoside and oleuropein.Sesame lignans, which help guard against lipid peroxidation, extend the stability of DHA in your body, and support a healthy inflammatory response. Take two (2) soft-gels twice daily with meals, or as recommended by a healthcare practitioner.